Win A One Month Supply of Popchips! Love. Without the handles. Popchips President of Pop Culture. No love handles here. Sorry, he does not come with the month's supply of Popchips. Once again our good friends at Popchips have generously offered to give a 1-month supply of Popchips (one case) to 10 lucky AppforHealth.com readers. I love their tagline: Love. Without the Handles. I’ll say this much… you certainly don’t see any love handles on their President of Pop Culture, the lovely Ashton Kutcher. Leave a “comment” below with what you’d like to see more of on our site. Product recos, freebies, in-depth nutrition articles, something we haven’t thought of? It’s your chance to help us help your Appetite for Health! Winners will be chosen at random. We will announce the winners on our Facebook page on Tuesday, March 29, 2011. Terms and conditions apply. Popchips – salt and pepper are the yummiest! I love the things I am finding on your blog but I think I will have to second/third/etc what I am seeing above. more coupons and of course freebies are ALWAYS more than welcome. I just found the popchips in our area but I noticed the flavor selection was limited and they sold out pretty quickly. Looking forward to trying some! I’d like to see more freebies! Looks Yummy!! And the chips look yummy, too!! Would love to win and give them a try. The chips!! I feel like I’m the only one that hasn’t tried these as of yet! I absolutely love your blog and find it very informative and interesting. However, you may want to do some success stories, a place where readers can write in with what they are doing to achieve a healthier lifestyle. Maybe a section on facts vs myths, because I am sure I am not the only one that reads so many contradictory statements and never know if what I am doing is right or wrong. Your giveaways are awesome and the more the merrier, right?!?! And the idea of coupons mentioned above would be great! Thanks for a great place to learn about healthy living – I really enjoy you ladies! Love following you on Facebook! I would like to see more coupon opportunities for healthier food–seems like my biggest challenge as a coupon-er is finding deals that aren’t on processed packaged foods! Thanks for all of the great information you send out! I absolutely love the comparisons you do and would definitely suggest keeping those coming. You recently did one on different snack/chips and it’s a wonderful tool to have at hand. Success stories would be great….I see some fans who share theirs on facebook and it’s nice. Perhaps some ideas for people at various ranges of “getting in shape” such as foods you’ve found that satisfy various “cravings” without reaching for the UNHEALTHY alternatives. I love the recipes you share, that is defintely a PLUS for me!! I like you on fb and twitter, signed up for your newsletter, and tweeted. I’d like to see more coupons and suggestions on how to be thrifty and fit. Dig the giveaway. Maybe links to offers. I like reviews of healthy snacks and also ways to be healthy but thrifty at the same time. The good for you stuff is always so expensive. I think the giveaways you do are great! Thanks. I would like to see more healthy receipes. I love the website as it is. but if i could change some things it would just to add some inspirational/ informational stories, such as what to do or how to stay healthy after emotional, physical or environmental issues that occur in our daily lives. maybe even some delicous/healthy recipes to use. hey, maybe even a “quote of the day!”. Those are just some ideas. Love you guys!!! popchips are the greatest!!! they are soo tasty and good for my diet and their customer service is the best!!!!! I like “Appetite for Health” on FB. Recipes, coupons, articles and freebies are all my favorites. Maybe you could add free samples and reviews. I’d like to see more info on healthy ways to incoporate veggies into dishes! I love in-depth nutrition reviews. Also, product comparisons, from the perspective of taste, nutrition, and price are always fun to read. I’d like to see more coupons. More freebies! As a nutriton major, I’d also like to see more nutrition articles such as GM foods vs non GM Foods, a sample meal plan, etc. I’d like to see a recipe feature where traditional or regional favorites are converted into either lowfat,low sugar or both. Product recommendations with nutrition updates and freebies! In my busy real world life I find some things on Appetite for Health really helpful. For example, I am really into trying new things yet time to look for them, actually buy them, the money to try all of them and time to actually taste,use, review etc them sometimes eludes me. That is why I love reading actual reviews and suggestions for products…it saves alot of time and trial and error for me…I would like to see more of that on your Blog. I also love freebie, giveaways and contest of course! They put a needed spark in my hectic life. Lately I have been into fitness and real testimonials from real people and tips and suggestions relating to fitness and weight loss are also very much appreciated! I love all the advice and it real gives me more motivation and spurs me on! Thanks! I “Like” ..er actually “Love” you on facebook…it alerts me to interesting things going on in your .com! Haven’t tried “pop chips”, actually I live in a rural area and have not seen them in the little grocery store yet. They sound like a great snack. Would love to try them. Like you on FB and receive your newsletter! Thanks! Would like to see info on natural supplements and benefits of herbal teas. Oh. And I am not a twit, so I don’t tweet. Would love to see even more healthy, delicious recipes, more giveaways, and maybe workout reviews? LOVE LOVE LOVE popchips. They are so delicious and such a wonderful treat!! Thank you for the giveaway!!! What you are doing already is great! Here’s an idea you may want to incorporate: challenges. When the YMCA added a triathlon, actually is was a chart and each day you recorded your workout and someone would color in the sections of your graph for you, I was so motivated to see myself complete it. Or, maybe you could post an ideal plan for daily servings, including water, and your readers could chart their progress. (Believe it or not, part of my weight problem is not eating enough, so my metabolism is too slow. I need to see that I still haven’t eaten enough protein or had enough water for the day, so it will encourage me to go ahead and eat or drink enough.) Thank you for the opportunity to suggest ideas and the possibility of winning PopChips…They are amazing! My best friend gave a huge bag of popchips for a Xmas present,since then I’ve been hooked. Thank you for the great contest. What I’d to see more of is nutrition for men. Following on Facebook and shared. Follow on twitter @mailmandave11 and tweeted. Always love to see more freebies on your site! I also follow on facebook! It all looks good now but more trivia and contests would be lots of fun! Hi, Well I love what your doing already, im here & FB checking out what you have posted everyday, I find a lot of information that I reallyI enjoy reading about, im pretty much into healthy foods, low fat being most important to me(health wise I mean) diet/weight loss too, but more important for me is healthy low fat/no fat foods. I think if you really eat healthy foods-> less fat & less sugar, weight loss will be a part of it. Your site is great already, I like the nutrition articles a lot, one with information on foods that will help people fill full might be nice touch. and I’ll Tweet you in a couple minutes. I would like to see more recipes avoiding the major allergens – gluten, milk, egg etc. – or suggestions giving substitutions to make them allergen free yet still retain the nutrient level. I’d love to see something like a “Villain of the month” piece. I’m thinking about foods which purport to be healthy or low in calories and are nothing of the sort. I’m tired of trawling the supermarket aisles and finding that every cereal contains sugar and a tiny pot of dessert has over 200 calories. I’m also interested in scientific investigations into obesity and the latest thinking on genetics, drugs and additives. I think a piece on Stevia would be interesting now that it is about to become legal in the UK. Done all of the above. Like some others have said already I would like to see more coupons & free samples, and perhaps an email to let me know about these when they are available. Liking on FB and following on Twitter @ArielsSister. I’d like to see Popchips in more grocery stores. Kroger is always out or very low on inventory (because they are SO good and healthy! ), and I don’t see them at the Publix near my home. It’s all about being healthy and having fun – so pleanty of nice easy recipes, lots of ineraction, and loads of prizes as treats! How about a Q and A section ?? Love your site – really makes me think about eating healthy – gives me the latest and greatest info. The give-aways are always a blast. I think info for the whole family – the men, the teens, the small kids…and especially for mom’s to take care of themselves -that is the content we all need at our fingertips. Thanks for what you do! I love the muscular man! I have signed up, liked, tweeted, and commented! Would welcome snacks. Signed up to your newsletter. Have done all above and would love to see more nice and quick healthy recipes for busy mums like me! I would like to see freebies and coupons. I love popchips and would be thrilled to win a month’s supply. On your website, I’d like to see an article about how sleep affects your diet. Love the pop chips! My whole family does! Would love to see more healthy recipes and snack ideas and of course freebies, coupons are always fabulous! I have just found this site but I was thinking that grilling season is coming up so I would like to see some healthy grilling tips. More healthy giveaways or contests. I liked on fb and signed up for your newsletter- hoping to get some new info from you guys! I don’t tweet either so hopefully I am still able to win! Thanks! would like to see more of Ashton! I would love to see more delicious recipes!! Keep it up. Coupons and Freebies are always in demand – would love to see more of those. Free samples, recipes, would all be great! Hi! I am new here and love it! What a huge gob of resources and tips! yay! I used a site once that helped me track my intake of various things by entering the foods I was eating.. that was a fantastic way to monitor myself and see where I needed to make changes! I would love to see that kind of tool or reference on here and make this a one-stop health site for ALL the things I could think of! Thanks so much and party on! Recipes are always great but more freebies is just an added bonus! I would love to see more new flavors. The ones you have already are yummy, my fave are salt & pepper. But, itching for a new flavor 🙂 . Maybe even some new crazy combo flavor! Thanks POP CHIPS for being a tasty and healthy alt. ! I really love POP chips and have been telling everyone about them. I would love to see more freebies and more reviews on products. I would like to see more product recommendations. I’ve been a Popchips lover for over a year and am glad to see them in more stores. I enjoy that you are creating gluten free chips…keep the gf flavors coming! I would love to know where I can find Popchips!!! I’d love to see coupons! Would love to see more give aways! Freebies and coupons are great, but I would love more tasty recipes! I would love to see more free giveaways on your site. I love the freebies and contests! Don’t we all love free samples and giveaways? Oh yes. I love PopChips. My favorite flavor is Barbeque. But darn, at the store today, where I planned on buying a couple of bags, I found that they no longer carry that flavor!?!? So, it’s a special trip out tomorrow to find bbq!!! 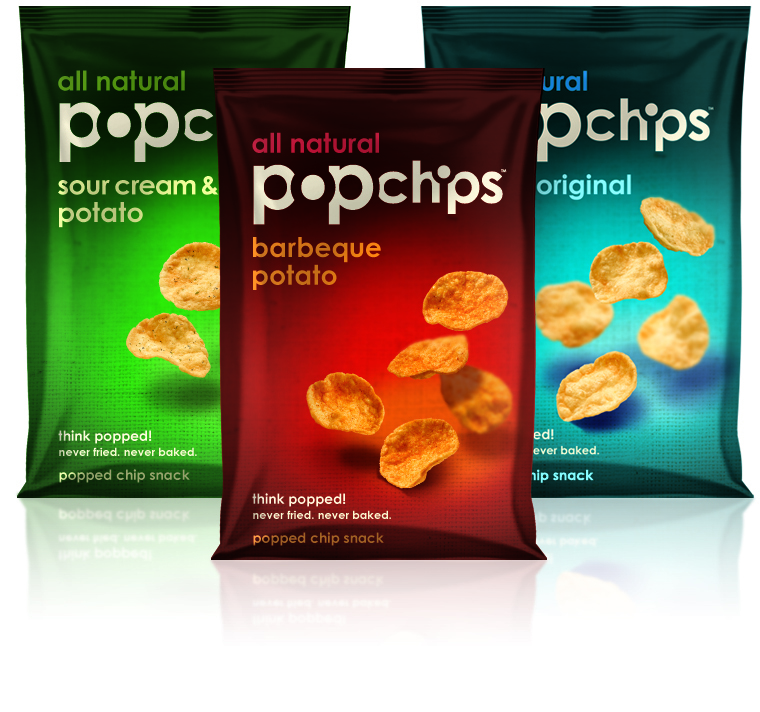 Love popchips…will never go back to regular chips as long as popchips are avai! I signed up for your emails, and liked you on facebook. Thanks for the opportunity! Love these chips! Love that they are healthy too! I love freebies! I also love easy recipes! Oh yes, freebies and coupons please! How about a sweet version of Popchips? Where do I find the other flavors? In my area I have only found two flavors. We LOVE Popchips!! We’re so thankful for the coupons we have used in the past, and that Popchips are popping up in more local grocery stores too! what i’d like to see are more success stories, coupons, freebies are nice, sweepstakes, and of course recipes!!!!!!!!!!!!!! also would like to see healthy lifestyle articles … thanks. I’d love to see more of your recommendations. I love finding out about new healthy products to taste! You guys are great! I LOVE Popchips and have hooked about 7 people in my office on them! Call me a promoter of your product! I would love to see more in-depth articles debunking nutrition myths and helping people to pinpoint the foods they should be eating and the foods that are ok to eat. Love Popchips- we always have them in our house! I enjoy Popchips and I would like to see more recipes and coupons. Would love to see a button titled “Where to Eat” and/or “AFH Partnered” establishments with promo specials on this site and bonus 10+ % discount for food items promoted that day/week and a twitter related service for users who can either print off this site, or get a “sweet-tweet” promo item tweeted……to the “AFH Partner” of the day……. i would love to see easy healthy recipes for busy mums. Love Pop Chips. Found BBQ flavour at Costco! Would like to see more articles about the good and bad of drinking beer. I realize this follows the pattern but I believe social media will replace surveys as a way to communicate with some of our favorite earth/body/mind conscious foods and products. 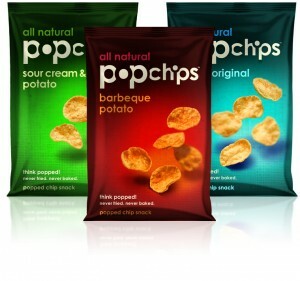 Have never tried Popchips but have heard good things & would really like to try. more coupons for Popchips is what I would like to see more of, I can’t get enough they are sooooo good! I would love to see freebies or coupons. More store availability I can only find them in Target. I would love more in-depth nutrional articles- maybe some geared towards the little peeps? My kids are always wanting to know ‘why’ we eat the foods we eat…and they want to know what/where it specifically benefits! I’d like to see more recipes on your site since I like trying different dishes. I would like freebies and coupons. I like on fb, signed up, and tweet. I love Pop Chips and the Salt and Vinegar are awesome either by themselves, put inside a sandwich with deli turkey or dipping in garlic hummus. I’d love to see some quick “nacho” recipes. Right now I sprinkle low fat provolone on top and nuke for 20 seconds. I “liked” you on FB!! How about coupons for healthy snacks like Pop Chips! I just finished my bag of barbeque popchips and need to go to the store to get more. Coupons would probably let me buy TWO bags! These sound great, I know my 8 yr old loves them. Have never tried Pop Chips. Looking forward to trying them. I like things that are healthy for you. Would not mind if there was a sample but if not I will go and purchase a bag. Thanks for offering the product. “Can’t eat just one of these “delicious chips” They are GREAT!!!!!!! I’d love to see healthy and delicious recipes for toning abs! have done all the steps, fingers crossed! Would love to see more tasteful flavor with a variety of herb seasonings. Freebies, coupons,sweeps, healthy product reviews & easy healthy recipes that don’t take too much time, fancy cooking skills or hard to find items!